The Intouchables is a French comedy-drama film directed by Olivier Nakache and Éric Toledano. It stars François Cluzet and Omar Sy. The plot of the film is inspired by the true story of Philippe Pozzo di Borgo and his caregiver Abdel Sellou, discovered by the directors in A la vie, à la mort, a documentary film. 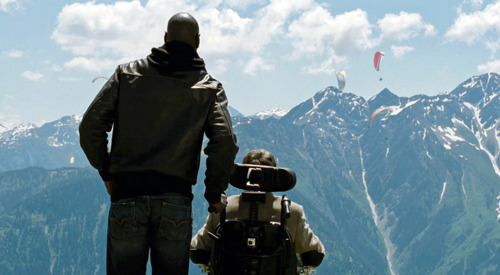 The Intouchables maybe cheesey and corny in places, but this film leaves a smile on your face and a rejuvenated confidence in the morality of human beings. Give a man responsibility to fellow man and he will behave responsibly. It is based on a true story but the facts are slightly adapted for the screen, although that doesn’t stop this film from being wholly predictable. The paragliding shots are funny and there is great chemistry between Sy and Cluzet throughout the film Which elegantly displays that they’re the only two in the room to understand their jokes…. It’s funny and at times, provides a humorous take on disability. This movie has flaws for sure but it’s charm is inimitable and it does exactly what it sets out to do… uplift and entertain. The Intouchables is out now on DVD.